A zipper type capsule is convenient and can be easily set up on the water tank cage. Available to contain extra tube and punk patch. Manufacturer : BM WORKS Model : Tool Capsule Package Content : 1 x Tool Capsule (*Product does NOT come with any accessories shown in the picture.) Manufacturer Color : RED Size : 195 x 70(65) x 70(65)mm (7.68 x 2.75(2.56) x 2.75(2.56) inches) Weight : 150g (5.29 ounce) Features Practical and Effective Storage Tool capsule has totally different storage from other normal bike tool case Space is divided into multiple pockets inside so that you can organize and find items easily. Left section Left section has 2 mini pockets and 1 big pocket Store tire levers, mini tools, micro pump and ETC Right section Right section has a giant multi zip-up pocket Store extra tubes, puncture patchs, and other accessory COG ZIPPER HANDLE 10T cog applied to zipper handle design SEMI AUTO SLIDE ZIPPER It doesn¡¯t make annoying sound when you ride a bike. T.P.R TAG LABEL Small label gives you big satisfaction. INFOGRAPHIC LABEL Prepare all you need before ride. Product does NOT come with any accessories shown in the picture and Color may vary depending on the monitor. BM WORKS Riding a bicycle is fun and exciting experience. However, you may have faced several difficult situations while cycling, and imagine 'this kind of product would be great to have...' BM WORKS decided to become someone who makes products you wished for. Experience big improvement by small changes. If you have any questions about this product by BM WORKS, contact us by completing and submitting the form below. If you are looking for a specif part number, please include it with your message. 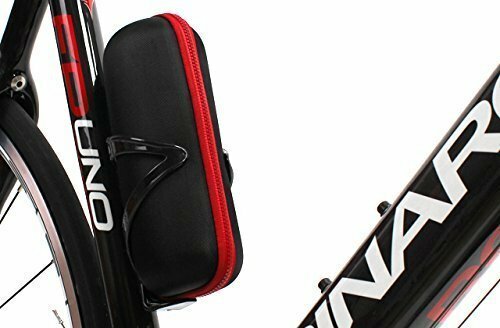 triseven Rear Carrier System - Lightweight Cycling, Triathlon MTB | Easy to Mount & Holds 1 Water Bottle Cage | Includes Complimentary Composite Water Cage!